The Eco Team is a group of children, led by Mrs Matusiak, who take on several projects throughout the year, all of which help the school remain environmentally friendly. We achieved our first green flag in July 2018! Pupils are nominated by their peers to be on the Eco-Committee. This includes all KS1, KS2, KS3 and KS4 year groups in the school. Nurseries, colleges and specialist schools can adapt their Eco-Committee to suit their setting. NB. It is not necessary to re-elect the pupils on the Eco-Committee every academic year, allow pupils to remain on the Eco-Committee if they wish, so they are able to see the impacts of their actions. Minutes are displayed on your Eco-Board. Reports of your Eco-Committee meetings are made available to the Board of Governors and PTA. Pupil representatives ensure that there is communication to and from the Eco-Committee to the rest of the school. An informal Environmental Review covering all ten topics is carried out by pupils (with adult supervision). 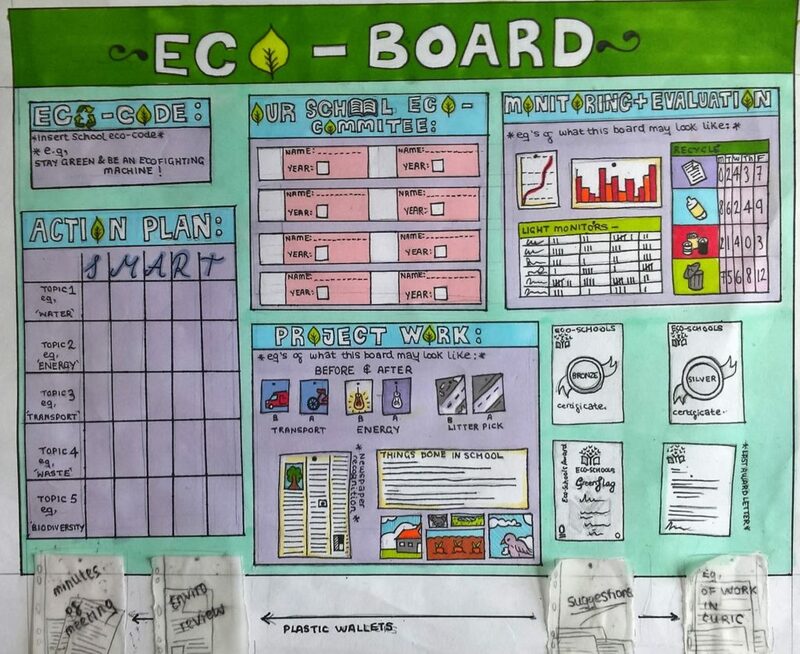 A copy of your Environmental Review must be displayed on your Eco-Board and the results communicated with the whole school. It is compulsory for the Green Flag award that your Environmental Review is updated every two years to coincide with your renewal application, however it can be carried out every year as best practice. Your Eco-Committee produces an Action Plan influenced by their Environmental Review. Pupils on the Eco-Committee take responsibility for leading the actions. The Action Plan contains timescales, who is responsible and how targets will be monitored and evaluated. The Eco-Committee has shared the Action Plan with the whole of the school. A copy of the Action Plan is displayed on your Eco-Board. Environmental issues have been covered in at least three areas of the curriculum; this is clearly evident in schemes of work and lesson plans. The three curriculum examples do not have to be from the same Eco-Schools topics as those chosen for your Action Plan. Your school has a prominent and designated Eco-Board detailing all Eco-Schools activities, including a copy of your Environmental Review, Action Plan, minutes, before and after photographs and photographs of Eco-Committee members (or list of student names if photos are not possible). Your Eco-Board should be kept up to date. Your Eco-Committee should use a variety of mediums to help communicate their actions; newsletters, school website, the school’s Twitter account – be inventive! The wider community is involved in activities going on in and around the school, for example parents, carers, local businesses, environmental organisations, local churches and residential groups and homes. Links should be made with local Eco-Schools to share best practice. Your Eco-Committee monitors the effectiveness of their Eco-Schools work: via data collection or before and after photographs etc. This evidence is communicated to the whole school and on display on your Eco-Board. Some monitoring data has been effectively used in curriculum work for example creating graphs and charts on energy and water usage to be used in maths lessons (this also supports Step 4). Evidence and data collected has been analysed and evaluated to help pupils develop further actions. There is an agreement on an environmental statement for the school drawn up by the Eco-Committee. Your Eco-code must reflect the Topic project work which you are working on for your Green Flag. The Eco-Code is displayed on the Eco-Board. The Eco-Code is also displayed around the school – in classrooms, school halls, even the toilets! The Eco-Code is known and understood by the majority of pupils and staff.